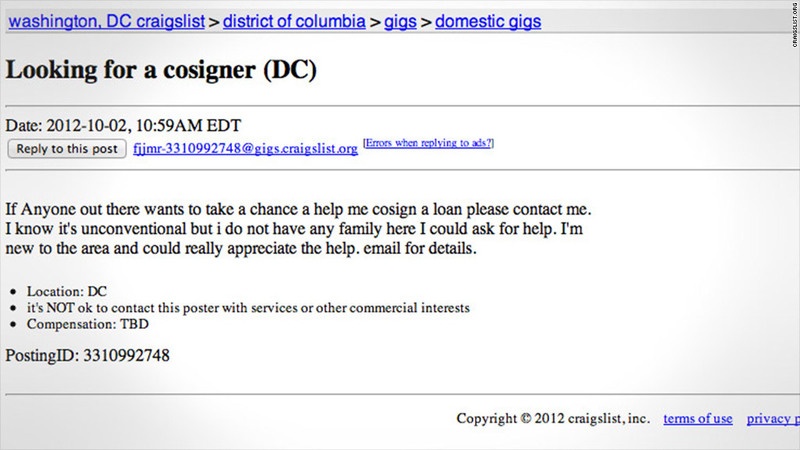 Desperate for loans, some people are posting ads on Craigslist in hopes of finding co-signers. In a new sign of desperation, people are turning to Craigslist to search for co-signers when they don't have good enough credit to qualify for loans on their own. Javier Cruz, 22, who came to the United States on a student visa from Mexico, was hoping to transfer to Texas Tech University's two-year nursing program next fall after he finishes the year at El Paso Community College. But when his mom lost her job eight months ago, the monthly checks Cruz had been receiving from his parents stopped. Without that help, he couldn't afford the nursing program's $8,000 per semester tuition. He applied for a $20,000 loan, but given his limited credit history and low income, he didn't qualify without a co-signer. None of his friends had good enough credit, so he turned to Craigslist -- offering $1,000 to anyone willing to co-sign on the loan. "Everybody talks about Craigslist and looks for things there, so I decided to put [an ad] there," he said. Since he first posted the ad last month, Cruz has received four responses. But each respondent has either requested his bank account number or routing number, or asked for the $1,000 up front -- leading him to believe they were scammers. And if Cruz doesn't remain a student, he could lose his visa. "If I don't get [a loan], I think I'm going to have to go back with my parents in Mexico," he said. Just scroll through Craigslist's "Financial services" section and you'll see ads from people like Cruz seeking co-signers for personal, auto, student, home and business loans -- as well as co-signers for rental homes or apartments. One woman from Montana promises $500 to "a Special Person" willing to co-sign a $2,500 loan that will help her purchase a 1978 Shovelhead Harley Davidson, while someone in Ohio is offering up a tractor and car as collateral for anyone who co-signs a $5,000 personal loan. A Richmond, Va.-based quiche-making company seeking a business loan is willing to give a co-signer $5,000 and a stake in the company. A Craigslist spokeswoman didn't respond to requests for comment about this practice or whether it's permitted on the site. It's a dangerous trend, said John Ulzheimer, president of consumer education at SmartCredit.com. Borrowers looking for co-signers can easily get scammed out of the money they're offering as a payment or get their identity stolen if they provide their personal information. The proposition is even riskier for anyone who co-signs one of these loans. While it might seem like an easy way to make some quick cash, the ad could be a ploy to steal your identity and money. And there are other serious consequences that you face as a co-signer. "You're co-signing for someone a bank has already identified as someone who doesn't deserve the loan," said Ulzheimer. Not only are you expected to pay the loan in full if the borrower fails to make payments or defaults, but you may also be on the hook for late fees and collection costs. Creditors can sue and attempt to garnish your wages to collect the money, and late payments or any record of default will appear on your credit reports and hurt your credit scores. The chances of being asked to step in are high: As many as three out of four co-signers are called upon to repay loans that have gone into default, according to the Federal Trade Commission. Even if the borrower and co-signer sign a legal contract that says the co-signer isn't responsible for the debt, the bank can still go after them if the borrower defaults -- and it is then up to the co-signer to chase down the borrower for the funds owed, said Carol Kaplan, a spokeswoman for the American Bankers Association. But some people are still tempted to take this risk. According to Larry Williams, a 25-year-old student at Rutgers University in New Jersey, he has come close to finding someone willing to co-sign for the $8,000 loan he's seeking. Williams hasn't been able to keep up with his rent and other bills after losing several thousand dollars to gambling and other bad financial decisions. The loan would help him get back on track, he says, and he plans to find full-time work when he graduates next spring so he can pay it off. After posting an ad on Craigslist offering to pay a co-signer $2,000, he was inundated with responses from scammers. He even paid a $10 fee to sign up for a matchmaking service that promised to pair him with a co-signer, but it never panned out. Eventually, though, he heard from two different people who agreed to help him. They even asked him for the co-signer form to sign. Related: Can I get out of a car loan that I co-signed? But at the last minute they each decided it was just too risky -- especially since Williams had no collateral. One of them had even lost money as a co-signer in the past, he said. Williams said he understands that it's a big risk, but he is still hopeful. "I know it's like strangers and everything [on Craigslist], but I don't have any family members to go to to co-sign a loan for me," he said. "I almost found success, so I'm hoping there's just one person out there who's willing to help."